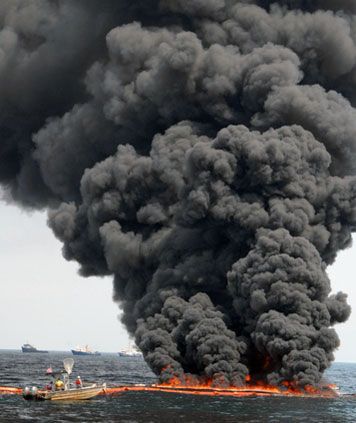 An example of in-situ burning during oil spill remediation. Photo provided by the NOAA Office of Response and Restoration. Accidental oil spills, such as the 1989 Exxon Valdez and 2010 Deepwater Horizon, are responsible for some of the worst man-made environmental disasters in our history. The 11 million gallons of crude that leaked from the hull of the Exxon Valdez devastated Alaska’s Prince William Sound. The largest spill, the Deepwater Horizon blowout, released almost 210 million gallons of crude oil into the Gulf of Mexico. The effects of this event severely damaged the Gulf ecosystem, played havoc with the local economy, and presented enormous challenges to cleanup crews. Currently, there are three common methods of cleaning up oil spills over water: skimming, dispersion, and in-situ burning. Skimming uses a boat to tow a collection boom that corrals the oil, which is then picked up by a ‘skimmer’ and transferred to a collection tank. Dispersion is achieved by applying chemicals into the spilled oil that break it up into small droplets. In-situ burning gathers freshly spilled oil between booms and sets it on fire – a very sooty technique. The effectiveness of each method depends on environmental factors, such as wind, rain, water temperature and coastline proximity. Now researchers in the UMD Departments of Fire Protection Engineering (FPE) and Aerospace Engineering (AE) hope to offer a more efficient means of oil-spill cleanup. Inspired by the phenomenon known as the ‘blue whirl,’ FPE Associate Professor Michael Gollner, Aerospace Engineering Professor Elaine Oran, and FPE Postdoctoral Scholar Ali Tohidi will study fundamentals of fire whirls to make in-situ burning more efficient by encouraging their formation over the resulting fires. Gollner and Oran recently received word that the Bureau of Safety and Environmental Enforcement (BSEE) Oil Spill Preparedness Division will fund their study of fire whirls entitled, “Efficient Remediation of Oil Spills over Water Using Fire Whirls,” over the next 18 months. Gollner and his team, which also includes FPE Graduate Student Sriram Bharath Hariharan, will use the nearly $500K allotted to study the behavior of fire whirls over open water “including the flow structure, thermal composition, and emissions” at various scales. Gollner will lead the research effort, which will include experiments at small and medium scale at UMD, and large-scale experiments at Worcester Polytechnic Institute led by Dr. Ali S. Rangwala, a UMD FPE Alumni (MS, ‘04). Preliminary work on this topic was supported by the National Science Foundation through an EAGER award CBET-1507623 and by the University of Maryland through Minta Martin Endowment Funds in the Department of Aerospace Engineering and the Glenn L. Martin Institute Chaired Professorship at the A. James Clark School of Engineering.